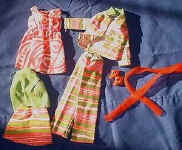 Vintage Barbie Doll Clothes Fashions 1969 - Forty-four new fashions were available, plus six Pak outfits, four gift sets The Julia doll was added in 1969, the doll and clothing is found on her doll page. 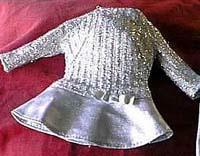 Vintage Barbie Doll Clothes Fashions 1970 - Thirty-one new outfits, ten Pak items, six gift sets or exclusives. For larger photos, full descriptions, click here.